Nozzolillo, C. and Lorenzetti, F.
Seeds of many species of legumes are capable of retaining germinability for many years in storage . According to these authors, the cultivated pea is not one of these long-lived species, retaining 70 to 100% germinability for only three years. However, recent work has shown otherwise. Murfet and Cramp , working with selected lines of peas, showed them to be capable of germination and growth after over 12 years of storage at ambient room temperature. It is important for curators of germplasm collections to know the maximum length of time seeds may be kept in storage before they must be planted out to produce a new crop of seeds. The present study is an examination of the ability of 51 pea lines from the Weibullsholm collection to retain germinability during cold storage. Seeds of 51 lines from the Weibullsholm collection (Landskrona, Sweden) were provided by Stig Blixt (Table 1). The lines contained a wide variety of mutations, but most were not commercial types, possessing the A allele (anthocyanin production) as well as other traits undesirable in a cultivar. The seeds had been harvested in specific years beginning in 1960 and stored in a cold room at 5oC since harvest. Seeds of most lines harvested in 1971 and had been stored in a freezer since harvest. All these seeds were shipped to Canada in two lots, one in 1977 and the other in 1980, where germination tests were performed within several months. For each line, lots of 25 seeds of uniform size were surface sterilized by immersion for 10 min in 10% sodium hypochlorite solution with a small amount of added detergent. These seeds were rinsed thoroughly with distilled water, imbibed for 24 h in distilled water and transferred to the surface of moist vermiculite in a 9 cm petri dish. The dishes were kept at 15oC under a 16 h light/8 h dark regime and germination counts were made daily. For most lines, only one lot of seeds from each harvest was tested. The exception were those lines that showed marked differences in the degree to which the seed coat had darkened on individual seeds. Seeds from these lines were divided according to testa color, and each color lot was tested separately. As many as four replicates were prepared for some lines. Germination was defined as the protrusion of the radicle through the seed coat. Remaining seed was kept in plastic bags in a walk-in -10oC freezer (except for a yearly defrosting, during which time the seeds were transferred to a cold storage room). About half the lines were planted in the field in Ottawa at the Central Experimental Farm, Agriculture Canada, in 1982 and 1983, and the harvest from these plants was also kept in the freezer. In 1994, germination of all seeds in storage was tested as follows: 30 seeds per lot were surface sterilized as above and imbibed in tap water for 6 h. Each lot was divided into three lots of 10 seeds, which were placed on moist vermiculite in individual petri dishes. The dishes were kept in darkness at 15oC, and germination counts were made daily until all seeds had either germinated or been overgrown by mold. As before, germination at three days was defined as the protrusion of the radicle through the seed coat. The per cent germination of each individual line from each harvest in Sweden is presented in Table 1. Subjection of the data in Table 1 to regression analysis shows, not surprisingly, that there is a general trend of reduced germinability with age (Fig. 1). Examination of the data in Table 1, however, shows that viability varies widely among the germplasm tested. The lines can be divided into four categories on the basis of percent germination versus time in storage (Fig. 2). Category A (decelerating function) includes seven lines whose germinability declined rapidly in the early years of storage to a negligible level by 10 years. Category B (accelerating function) includes five lines that maintained a high germinability for the first seven years in storage, after which germinability declined rapidly. Category C (linear function) consists of 14 lines exhibiting a more or less steady decline in germinability with time comparable to that shown in Fig. 1, and Category D (independent function) includes seven lines that maintained a high germinability for 18 years in cold storage. Many of the lines in Category D are wild accessions. The final category in Fig. 2, Category E, consists of the 18 lines for which too few data points are available or the data span too short a storage period. This group includes the only line, L1072, that showed an increase in germinability with time (from 20% after 6 years to 100% by 10 years). Table 1. Percent germination by three days of seeds of Pisum lines kept in cold storage from 1960 to 1977 or 1980 for a maximum of 20 years in Sweden. Figure 1. 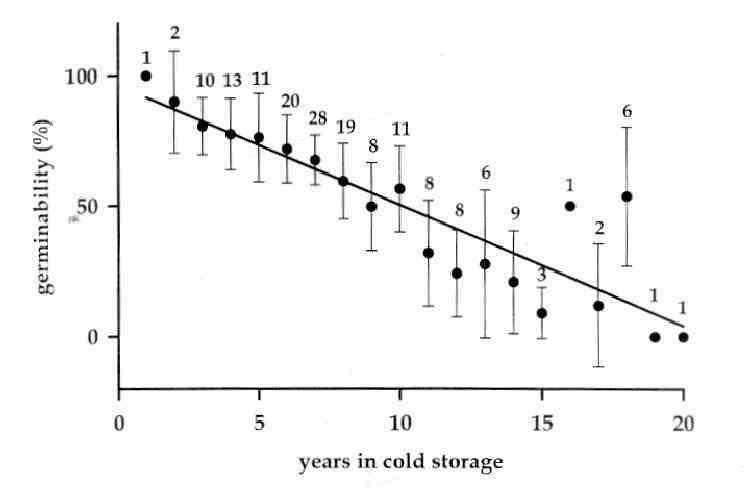 Decline in germinability with years in cold storage. Vertical bars show + s.e. of means determined from 2, 3, ..., or 28 lines. Figure 2. Variability in the response of individual pea lines to cold storage. Regression line from Fig. 1 is superimposed. See text for details. Freshly harvested pea seeds normally germinate 90% or better in two days, using the condition described above, unless hampered by an impervious testa. None of the lines tested after one or more years in storage exhibited the impervious testa character, and many lines had germinated over 90% by the second day. Thus, 90 to 100% germination by three days is an indication of a high degree of viability. L1072 may possess a hormonally-induced dormancy of the embryo that is slowly lost in storage. Many lines showing poor germination at three days were fully germinated by seven days. However, these seedlings were often abnormal, the most common defect being the rotting of the radicle and emergence of only the epicotyl. Such seedling usually developed adventitious roots from the hypocotyl and could be grown to maturity, but they would be unlikely candidates for successful planting in the field, as the study by Murfet and Cramp  would indicate. Thus, percent germination by three days is a better indicator of viability than percent germination at seven days. 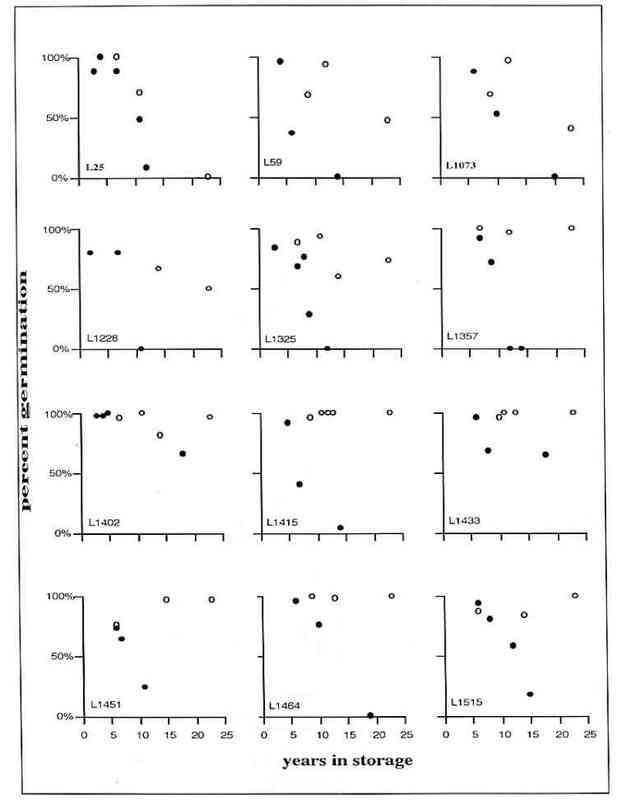 Variability of percent germination obtained in 1994 with triplicate lots of 10 seeds was rarely more than +10%, lending credence to the values obtained in 1978 with, for the most part, a single lot of 25 seeds. Comparison of the germinability of 26 lines stored in both the freezer and the cold room in Sweden in 1971 and tested in Canada in 1977 revealed that, on average, seeds stored in the freezer did little better than those stored in the cold (Fig. 3). 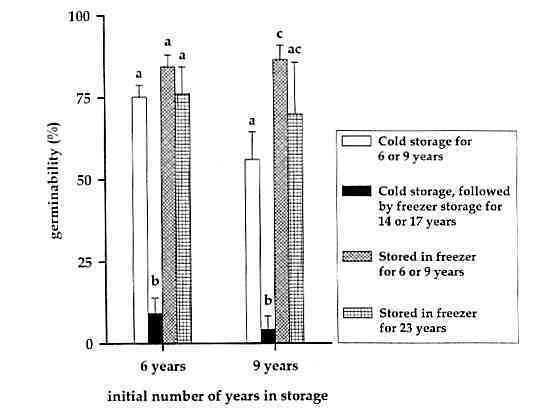 A similar test of seven different lines stored for nine years in Sweden and tested for germinability in Canada in 1980 showed a significantly higher germinability of seeds stored in the freezer (Fig. 3). Mean germination of freezer-stored seeds remained unchanged at about 85%, but mean germination of seeds stored in the cold declined over the three year period between the two tests. This decline is similar to that shown in the regression line in Fig. 1. After the above test, seeds of 24 of the lines remained stored in a freezer in Canada until 1994, for a total of 23 years in storage. As shown in Fig. 3, seeds stored in a freezer for 23 years maintained a high level of germinability, whereas seed of the same lines stored for six or nine years in the cold and then transferred to a freezer for 14 or 17 years exhibited a low germination rate. In fact, seeds of only two lines (L1228 and L1357) were able to germinate. Possibly metabolic activity during the 5oC storage left the seeds in a state that made them susceptible to freezing damage. Figure 3. Germinability of pea seeds kept under different storage conditions. The positive effect of freezer storage on germinability is shown in Fig. 4 in which individual responses of 12 lines selected on the basis of maximum available data are plotted. In every instance, freezer-stored seeds retained germinability for a longer time. No correlation was observed between color or darkening of testa and storability. Lines lacking anthocyanin (homozygous a) were present in each of the groups in Fig. 2 at about the same frequency as in the total population. Similarly, seed lots with darkened testa appeared to store equally well as those with a light testa (data not presented). Other mutants that were present in some of the lines and that have phenotypic effect on testa color or morphology (e.g. ar, am1, U-st) did not appear to influence seed viability in storage. Figure 4. Response of 12 pea lines to cold ( • ) or freezer ( o ) storage. The relationship of seed size, as determined in Sweden and reported in the computer data base, to germinability was analyzed (Fig. 5) on each of the four categories shown in Fig. 2. 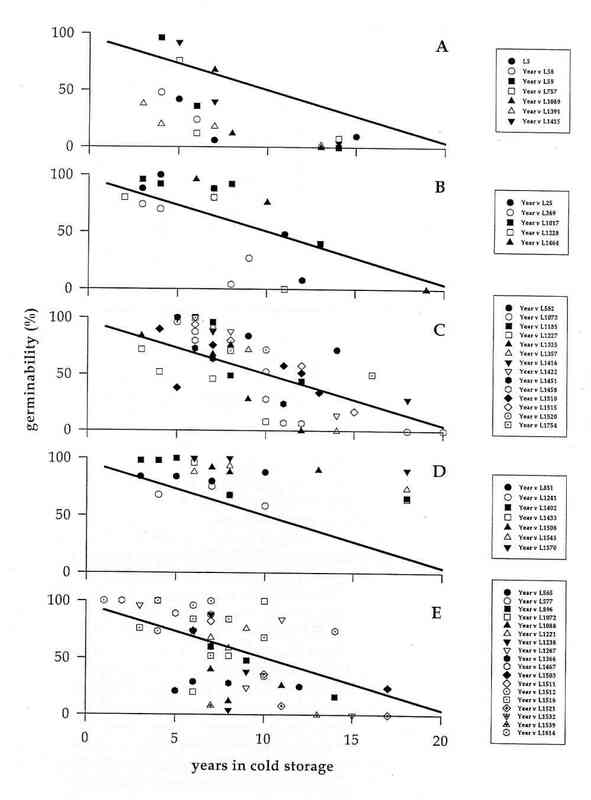 There was no significant relationship between seed size and germinability, although the largest mean seed size is found in categories A and B, the categories in which germinability drops to low levels after 10 years. The fact that a line with large seeds may be long-lived in cold storage (e.g. L1241, seed weight = 325g/1000 seeds, germination percent still 67% after 10 years) and a lines with small seeds may be short-lived (e.g. L1391, seed weight = 130g/1000, germination percent only 20% after four years) suggests that seed size, if involved at all in seed longevity, is only one of many possible factors. Figure 5. 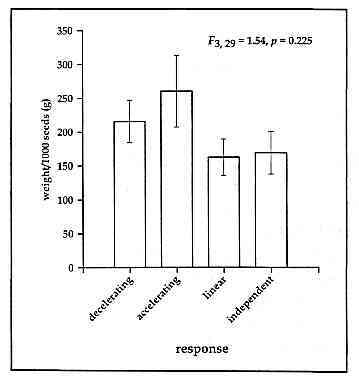 Weight of pea seeds as related to the different responses to cold storage. The present study demonstrates that the retention of germinability during storage varies widely among the different pea lines tested, strongly suggesting that genetic factors are involved. In general, storage in a freezer resulted in a longer retention of germinability, although seeds of some lines exhibited excellent survival at 5oC. A critical aspect that the present study has assumed to prevail is a low moisture content of the seeds in storage. The importance of low humidity was well illustrated when, owing to a break in one of the plastic bags in the freezer in Ottawa, moisture was able to enter the seed packages therein. During the annual thaw, some seeds germinated, and molds were able to grow. Not surprisingly, subsequent germinability of the affected seed lots was negligible. Apart from this one lot, whose germination performance was excluded from subsequent analyses, storage conditions, although probably not ideal, were the same for all lines studied. 1. Mayer, A.M. and A. Poljakoff-Mayber. 1989. Germination of seeds, 4th ed. Pergamon Press, Oxford, New York. pp 38-43. 2. Murfet, I.C. and R. Cramp. 1989. Pisum Newsl. 21:41-42. 3. Nozzolillo, C. and S. Seguin. 1984. Plant Physiol. 75:808-812.